The Mom & Baby bond is a magical one. We have carefully put a range together that will help make life a little easier so that you can simply enjoy this special time. We have products for Mom both during and after pregnancy as well as what you’ll need to gently care for baby. It all starts with some great sleep….. The BodyPillow Comfy-Curve “C” shaped maternity pillow is designed to follow the natural curves of your body. It may be used for support between the ankles, inner thighs and under your pregnant tummy. The pillow can also be used to support baby while breastfeeding, lying down or sitting upright. Super versatile – we love it!! And for baby we have sourced a sleeping cushion that helps Mom provide a tranquil, secure resting environment for baby, promoting a seamless integration from womb into our world. The NurtureOne Baby Cushion was researched, designed and developed by medical practitioners. Endorsed by an occupational, sensory and developmental therapist. 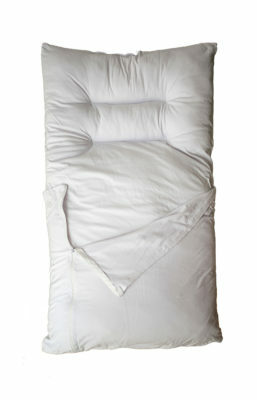 nurtureOne Nesting Cushion with built in sleeping bag. We believe that these two products will be a huge help! Getting a good nights rest as well as products to soothe baby and facilitate feeding are hugely beneficial. These are precious moments…enjoy every one of them!